One of the great things about Cells for Cells is that by donating to our program, you’re doing two good things in one: helping families that are battling cancer, and reducing waste through recycling. It’s our commitment to reducing needless waste, (and CFC co-founder, Jason Clements’ love for rock-climbing) that’s led us to a partnership with Sterling Rope. A high-tech nylon rope manufacturer, Sterling Rope recently launched its Rope Recycling Redemption Initiative, making it the only company in the United States which recycles nylon rope. Because we support Sterling Rope’s commitment to the environment, we decided to ask Outdoor Product Manager John Branagan some questions to increase awareness of this fantastic program. The Sterling Redemption Initiative was actually John Branagan’s brain child. We spoke with John to ask him some questions about his program, his passions, and why programs like Cells for Cells and the Sterling Initiative are so important. Jason: Sterling is leading the way in climbing rope recycling, how did it all start? Jason: Is Sterling Rope really the only company in the US that is recycling rope? John: YES. Millet does it in Europe, but not here in the US. Jason: Can you recycle any kinds of rope? John: Yes, any nylon (dynamic) rope can be recycled. Jason: What happens to a recycled rope? John: It is sent to a recycler that specializes in fibers. It is reprocessed and pelletized to be used in other manufacturing processes. Jason: Where do I buy/support the companies that use recycled ropes to create new products? Jason: Do you see the other climbing industries (shoes, hardware, etc.) following your lead and creating recycling programs? John: YES – there is a company that is taking back bouldering crash pads. I hope more try to do it. Jason: How does Sterling’s effort really have an impact on me? John: We all have choices, and I hope that our efforts impact you the climber to choose a brand that is at least trying to make a difference in our world. Jason: How many miles of rope would you guess you’ve have recycled? John: Well it is thousands and thousands of pounds so far, and the average rope a climber uses is just under 10 lbs. Jason: What is Sterling’s ultimate recycling goal? John: Our goal is simple: to provide an outlet for people to easily recycle their retired ropes with the least amount of impact on the environment. Jason: So how can I recycle my rope? John: 1) Look for Sterling Rope Redemption centers at climbing comps, slide shows, festivals, crag cleanups and indoor gyms around the country. Jason: How do I promote rope recycling at my gym? Jason: Okay, so what’s the deal with recycling cell phones? Why is a rope company promoting cell phone recycling? John: Everything that can be recycled should be recycled. I feel it is our responsibility to spread the word that old ropes or old phones are NOT trash— they are resources that need to be recycled! Jason: How did you get hooked up with Cells for Cells? Jason: Hey man, I know there are tons of cell phone recycling programs – why is Sterling promoting Cells for Cells? John: Cells for Cells has put more thought and research into the idea than most. Jason: Let’s get away from business – how long have you been climbing? Jason: What are your favorite shoes? John: My new favorites are Evolv. Jason: Where is you all-time favorite place to climb? John: Too many great choices! The places closest to home are always the best (North Conway, NH for me) but the New River Gorge in West Virginia is amazing! Jason: Did you work at Sterling first and then become a climber or vice versa? John: I was a climber first. Jason: What are your favorite climbing websites? John: NE Climbs (www.neclimbs.com). It is small and local. Jason: What are your favorite climbing magazines? Jason: What cell phone do you currently use? Jason: Any new ropes coming out? John: Our NEW Ion 9.5 is just hitting stores and has been getting great reviews. Jason: When you are climbing outdoors, do you see signs that the climbing community has good stewardship? John: Yes. I think the Access Fund, HERA foundation, and Climb for a Cure are all great examples. Jason: What can climbers do to be better at recycling? Jason: What can anyone do to be better at recycling? John: Add to preexisting programs like the Access Fund or HERA Foundation. Increase your efforts. If your local recycling center doesn’t take an item like batteries or # 5 plastics, don’t give up! The neighboring town might. If you look online you can find a way to recycle lots of things. John: There is no Silver Bullet solution to better living. There is however “Silver Buckshot” – if we all do a small part to contribute to solving a problem like excess waste we can have a serious impact. I uploaded my first picture that I want included in our Cells for Cells Family for the new website. This is me (Jason Clements), my younger brother, James, and my grandfather. We called him Papi (pop – ee). We were trying to remember when this was taken, and we think it was either 1996 or 1997 at Christmastime. Papi passed away from cancer in 2005. …and this is why I do Cells for Cells. I searched for this photo on flickr.com and could not find it. It only took a few minutes to find out why. I just didn’t have enough photos in my account for flickr to index my pics. Keep this in mind if you want to add your photos for the Cells for Cells family and you are new to flickr.com. If you only upload one picture, we will not be able to find it to add to our website. Why aren’t my photos appearing in groups or searches? If your account is new, first you need to upload at least 5 photos. After that minimum has been reached, then it shouldn’t take more than a few days until your photos appear in searches, groups, etc. To make sure your photos show in searches, remember to add accurate tags and descriptions. What is the safety setting? Items marked as moderate or restricted will not show in badges, RSS feeds, for people that have safe search on, or are not logged in. Is your account hidden from search? If only some photos aren’t showing, make sure they are not flagged to be hidden from searches. As promised, we have a capture of our new site. It is almost ready to go live. One of the new goals of our website is to involve YOU. In the photo area, on the homepage, we will rotate pictures that you, our Cells for Cells family, provide. Please join us by submitting a photo of you, your family, or your loved one. We would be honored to have you as a part of our Cells for Cells family. I have to first thank Penn Treaty from Philadelphia for donating a large box of phones. It was the perfect box to shoot this video with a nice mix of brand new phones and really old brick phones. What is so neat is that we can recycle all of it. Thank you Penn Treaty for supporting the Leukemia & Lymphoma Society in Philadelphia. Janine Ingram asked me to customize your poster for the Light the Night Walk that you are having at Angel Stadium on September 20th. If you can, please use this Battle Cancer with a Cell Phone poster. I like Israel Lagares. I enjoy that he is genuine. I enjoy that his mission is to help people just like Cells for Cells. His other site is www.healthranker.com. When you finish watching the vid here, jump over to either of Israel’s sites. Welcome to the Philadelphia Chapter and the Orange County/Inland Empire Chapter. Need more info about launching Cells for Cells in your chapter at your office? Contact Jason at jclements (at) cellsforcells (dot) com. The mission of Cells for Cells is to provide financial relief to families that are battling cancer. 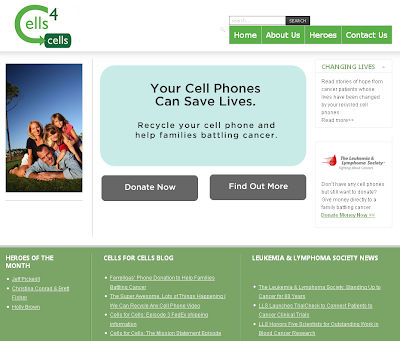 When you donate your cell phones to Cells for Cells, YOU are helping us achieve our mission!